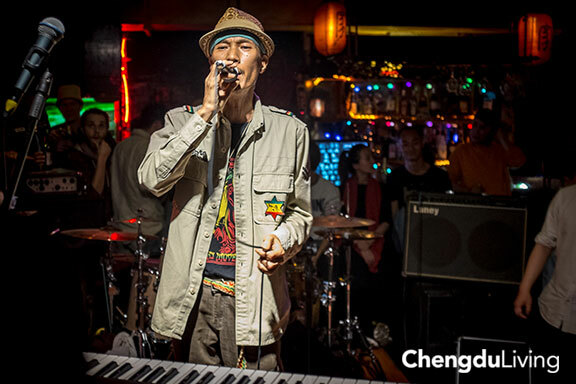 Lost in the roar of Chengdu’s nightlife, the sounds of musical collaboration float out of a little bar on the river called Jah. A huge pile of shared instruments dominates the center of the floor, and the place is full of local musicians out on a cold weeknight. 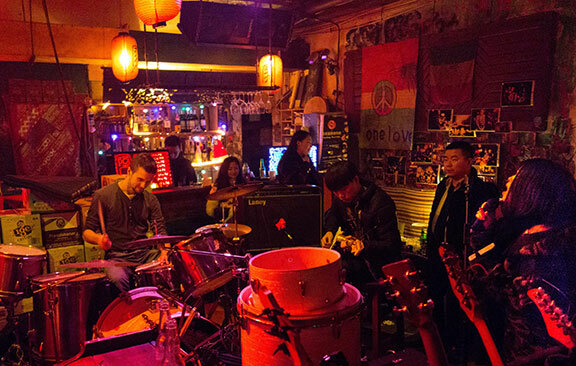 Owner Lao Li bounces between guitars and drums while holding down business, keeping the beat with one hand and waving his free hand at the bar staff. A female customer gets sick, Li helps her out of the bar, and another drummer jumps in to resume the jam session that will continue until 2 a.m. This is a typical night at Jah Bar. And according to Li, the musicmaking has basically been going on seven days a week for the last seven years. Li, from Northeast Sichuan, came up playing in angry bands in Chongqing, believing “only death metal is right.” As band members went their separate ways he moved to Chengdu in 2003 to “follow the music,” but found that bouncing between I.T. sales and marketing jobs was killing his creativity. “I feel like my life pushing me, pushing my guitar and also my arms away from me. I need to just take them back,” Li said. 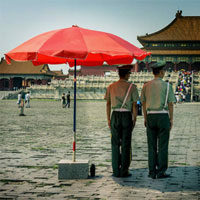 In, 2006, Li managed to sever ties with the nine-to-five world. 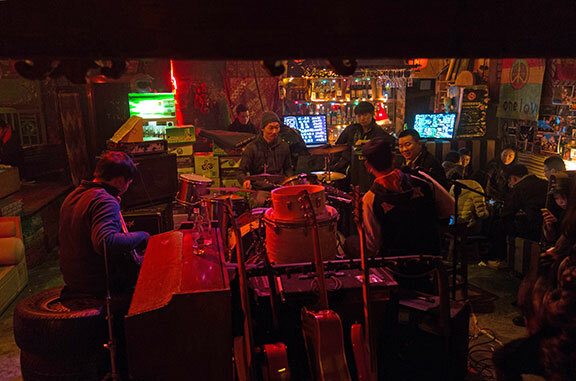 He initially hoarded instruments in a small space he had found in downtown Chengdu, playing music by day and selling cheap drinks at night. Then band practices started happening, and word got around to curious musicians that Jah Bar was a new gathering place open to anyone looking to play. After being open half a year, Jah was forced to move, the result of a “mafia style” feud with the landlord that led to the power supply being crashed, according to Li. 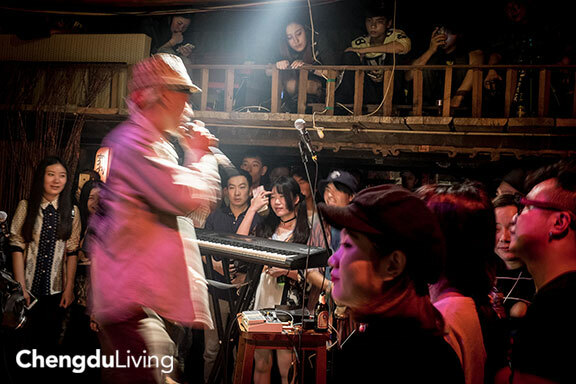 Soon after, Jah found its new home as one of the first bars on a laid-back piece of Jinjiang riverfront. At Jah, standard one-four-five progressions slip into strange improvisations and then veer into beatboxing and hip-hop. A traveling guitar player from Yunnan channels Delta Blues riffs. 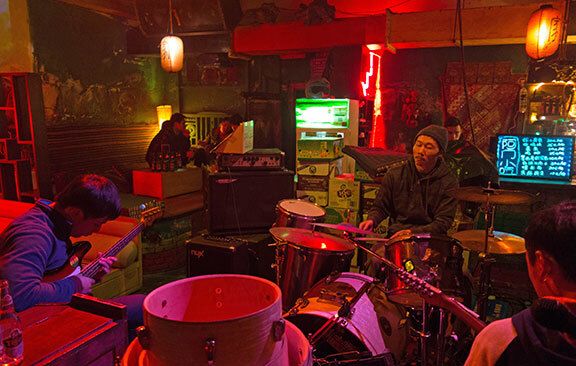 A session bassist from Taiwan plays funk melodies as drummers from Ukraine and Australia take turns on a well-worn trap set. 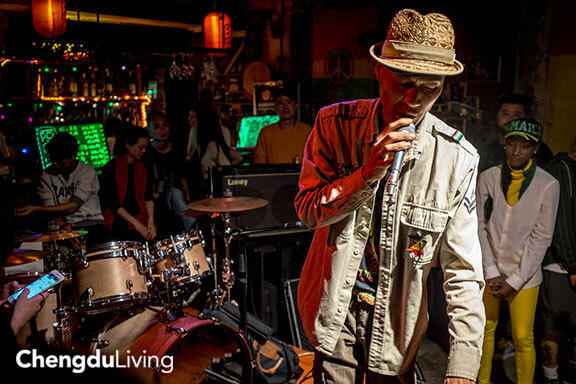 As far as being a Reggae-themed bar, a niche China has plenty of (and a musical style which Chinese immigrants to Jamaica played a part in the development of), the bar’s Bob Marley leanings are a result of Li’s shift away from strict death metal allegiance. Li says that city life is crazy and, understandably, a lot of young Chinese “just wanna be drunk” at the club, but he hopes that places like Jah can continue to draw talent to the underground in urban China. 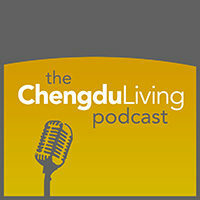 “When you’re making sounds you’re making guanxi with your sounds and other people,” Li said. You can find Jah by looking for a Rasta-colored sign featuring the similar-sounding Chinese character, jia, meaning home. Lao Li is probably there. Hey yo, you misspelled Chongqing as “Chongching.” Lil typo there, just a heads up, but it’ll probably upset the expats who live in CQ as they tend to have a bit of a chip on their shoulder about no one knowing that their city exists despite it being, like, 3 times larger as Chengdu (but far less international, hence the reason no one knows about it). Also, is it really “Jah” Bar? I mean, if that’s how the people behind it recommend it be transliterated then that’s cool, it makes sense given the reggae theme, but going by the Chinese it’s pretty clearly “Jia” Bar. I’m not trying to correct you on this one, just genuinely curious as to how you came up with the “Jah” thing. Thanks for catching that, it has been fixed! The bar is colloquially known as Jah Bar by expats in the city, I have never heard of anyone refer to it as Jia Bar. In Chinese it is 家吧 because that is the easiest way to communicate the name to Chinese speakers, and the two sound phonetically very similar. Basically everywhere you see Jah Bar referenced in English it is spelled that way though, it is an easier and better sound descriptor and I think the owner intended for the name to mean Jah. I will double check next time I see him though since I am now curious and have never asked about it. Wow, it sounds and looks like a cool place to visit!